Russell Martin has improved his value with a strong offensive second half, but the prospective free agent might have already turned down the largest contract offer he'll see this year. Martin, who homered again last night, is hitting well with weeks to go before his second career appearance on the free agent market. The Yankees made Martin a three-year extension offer in the $20MM range this spring, around the time Miguel Montero (five years, $60MM) and Yadier Molina (five years, $75MM) signed multiyear deals. Martin declined, deciding to let the market for catchers establish itself. His numbers have since dropped off compared to his first season in pinstripes. Going into this afternoon's game in Minnesota, the 29-year-old has 19 home runs with a .206/.309/.389 batting line in 458 plate appearances. Martin's batting average declined for the fifth consecutive season in 2012, and it’s be unreasonable to count on major improvements from a player whose batting average on balls in play has been below .300 every month of his two-year tenure with the Yankees. Yet he continues to draw walks and hit for some power. Plus, his second half numbers — a .236/.318/.435 slash line with 11 home runs — provide some reason for optimism. The right-handed hitter has a career line of .272/.386/.448 against left-handed pitching and while he’s not a part-time player at this stage in his career, Martin could be paired with a left-handed hitting backup to great effect. John Jaso or Jason Castro also figure to get regular playing time in 2013, but this kind of player — someone who hits right-handers much better than left-handers — would complement Martin’s offensive skills. Still, offensive numbers only reveal so much about a catcher’s value. Martin been durable, catching 120-plus games for the second consecutive season. He has prevented 24% of stolen base attempts so far in 2012, which is approximately league average. According to a pre-season scouting report in The Fielding Bible: Volume III, Martin has re-established himself as an above average defensive catcher. All told, advanced metrics suggest Martin continues adding value (1.3 wins above replacement, according to Baseball-Reference and 2.0 wins above replacement, according to FanGraphs), though no longer at the All-Star level he played at in the early part of his career. In the view of some prominent baseball executives Martin made a mistake when he turned down the Yankees’ extension offer. Three general managers recently suggested to Jon Heyman of CBSSports.com that Martin will have to settle for a one-year contract this coming offseason. A deal in the $7.5MM range seems appropriate, though a multiyear agreement remains possible, the GMs said. The last time Martin hit free agency he signed a one-year, $4MM contract with the Yankees. He had just missed a considerable portion of the 2010 season with a hip injury and been non-tendered by the Dodgers. Coming off of a healthy season, the Matt Colleran client figures to obtain a larger guarantee this time, even if he decides to accept a one-year, 'pillow' contract. He could also get multiyear offers given his youth and second half numbers. However, it seems unlikely Martin will see another $20MM offer following a below average offensive season. It’s always tougher to gauge catchers. There is a lot to what they are expected to do. They have to call a game, control a running game, make adjustments for the pitcher at times, and hit. That’s a lot for a rookie to digest right away, and it takes time. I’ll you give Wieters, for example. The O’s got him as a number 1 pick and threw him into the mix right away, it’s taken him the last three years to put it altogether. From what I’ve seen from Lavarnway, he’s a keeper, but he should have been left at AAA to continue to work on the defensive end of his game. Looks like he has a quick bat, so he’ll hit, but it won’t come quickly. Getting rid of Saltalamaccia and thrusting Lavarnway in right away could screw up his development, long term. Salty is arbitration eligible one last time in 2013. My guess is he will get around $4 mil for next season, which I would expect the Red Sox to agree to and then decide by next summer/fall if they want to extend him. He becomes a free agent after 2013. His caught stealing percentage is very low for his career and his WAR isn’t even at starter (2.0) level this year, despite hitting 24 hr’s. He’s not a contact hitter and doesn’t walk. For his type of hitter at catcher I think most teams would like to see better defense than what he offers. I’d be a little leery about giving him a 3 year deal. No way is salty worth that much if martin can’t get 3/20. Salty manages a .290 obp, and 5 more hr than martin doesn’t get you that much more when your obp is 20 points less. Lavarnway has struggled so far, but he has proven himself very good in the minors. Salty is really not a good offensive catcher. Lavarnway has hit at every level of the MiLB during his 3 year career, the questions have never, ever been about his bat, but about his defense and those have improved enough so that he will be fine. Taking 125AB and using that as a gauge is just wrong. Offensive player of the year in the Sox MiLB system 2 out of 3 times.. he is going to hit.. THAT ain’t going to be an issue. I understand his make up and what he’s done in the minors, but he needs to show it in the majors. His defense has been an issue yes and I know it’s early to judge as I said, but at some point he has to translate his minor league numbers to his pro numbers. I believe that Brian Cashman likes Martin and the Yankees will try to retain him. However, as always, Cashman has a number in mind and if somebody exceeds that, the Yankees will let him walk. 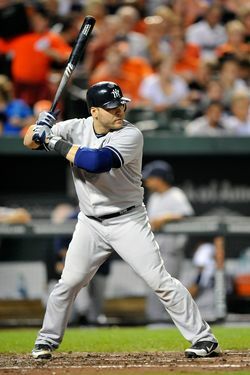 He is a good clubhouse guy, a decent defender, and in the Yankee lineup he fits in well. I hope Martin comes back. He has had a rough year, but he istill is near the top of the league in pitches per PA. He also takes alot of walks, he is not expected to do it all, just get on base and let the people around him get him around. He also gets almost 20 hr a season. He works patiently which fits perfectly on the Yankees. Get a deal Russell, Yankees!